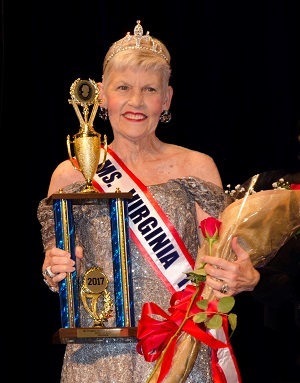 Cheryl Brown Davis, of Heathsville, Virginia, was crowned queen at the 2017 Ms. Virginia Senior America Pageant in June 2017 and went on to become a top-ten finalist at the National Ms. Senior America Pageant in Atlantic City, NJ. Music has shaped Cheryl’s entire life. She graduated from Madison College with a Bachelor of Music Degree, then on to a Master’s Degree in Voice Performance from the University of Michigan and later completing her Doctoral Degree in Curriculum and Instruction at the University of Virginia. She has sung professionally, and during her career, taught at all school levels. After thirty-eight years and retirement, she entered an exciting new life and family chapter. It has enabled her to fully engage in her love of community and music, and all things historical. She directs two community music groups, performs with local instrumentalists of Virginia's Northern Neck Orchestra, adjudicates music festivals and is her church's organist. She volunteers with local and national historical societies and acts as the local Daughter of the American Revolution Regent. Ms. Davis's pageant talent category was a vocal performance of "I have Confidence" from the musical "The Sound of Music."